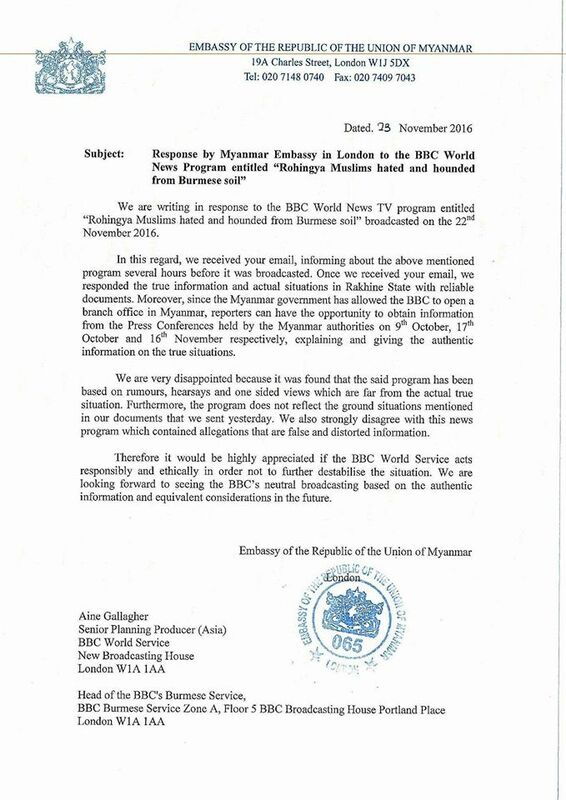 Burmese officials have lodged complaints with both the UN refugee agency (UNHCR) and the BBC World Service over comments and reports made on the Arakan State situation last week. Burma Army soldiers have poured into Maungdaw Township since Oct. 9 after coordinated attacks on border guard posts. Escalating violence during security operations has reportedly killed at least 86 people and displaced some 30,000, with hundreds reportedly fleeing across the border to Bangladesh. Burma’s representative to the UN U Htin Linn met with the UNHCR’s assistant high commissioner for protection Mr. Volker Turk in Geneva, Switzerland on Saturday concerning a statement made to the BBC by a UNHCR official, according to a State Counselor’s Office Information Committee statement issued Sunday. U Htin Lin questioned Mr. Volker Turk about whether the comments were an official UNHCR statement and encouraged the UNHCR to hold John McKissick responsible, according to the statement. If necessary, U Htin Lin said he would deliver an official objection letter to the UN. “If such allegations were indeed made by the UNHCR then Myanmar lodges strong objection against the UNHCR for unjust allegations made without substantiating evidence,” the statement read. Mr. Volker Turk reportedly responded that the UNHCR was also surprised by Mr. John McKissick’s statement and would reply with an appropriate response.